Dubai has been successfully developed as an economic hub and offers several shopping and travelling choices. Shopping in Dubai is a must; because the place has so much to enthuse. The land of Dubai is pretty famous for travelling and shopping. One may find almost everything in the shopping world of Great Dubai. The emirate is specifically eminent for the variety and prices of electronics that it offers. Dubai is well-known among tourists for electronics shopping; as it offers a marvelous assortment of high quality electronic gadgets at low prices and enormous discounts. You can find an inclusive collection of electronic shops in Dubai across gigantic malls and in the streets too. Dubai has rehabilitated at an unbelievable rate from a land of sandbanks to a metropolitan of sky scrappers. Not only this, but it has also progressed as one of the largest economic and shopping hub around the world. Every year Dubai caters the shopping needs of millions of tourists; who arrive here to shop from exquisite and large shopping arenas of Dubai. Being a tax-free state Dubai is utterly famous for its electronic shopping. It is a full-fledged showground of global electronic shops in Dubai that represents hundreds of brands from the entire world. Electronic items are also one of the recommended souvenirs to buy from Dubai. Below mentioned are the most preferable electronic shops in Dubai, that are highly recommended for electronics shopping by the locals, residents and tourists. Emax Electronics is one of the largest chains of electronic shops in Dubai across the UAE with more than 37 stores. Emax has one of the largest assortment of electronic products, which is comprised of 100,000 products from more than 200 international electronic brands systematized in 20 different categories. This mega product assortment of Emax offers an inclusive collection of high quality electronics to its valuable buyers. You may find the best of renowned brands from all around the world under one roof. One may choose from an extensive range of IT, video, audio, telecom and mobiles, appliances and photography, e-accessories, gaming, fitness and wellness, DIY (do-it-yourself) electronic product range, home solutions, gifting, computers, laptops, washing machines, cameras, kitchen appliances, consumer electronics and general electronic contraptions for personal use and much more. An Emax store can be easily located at Financial Center Road, Sheikh Mohammed Bin Zayed Road and in Alwaha Mall. Emax opens every day between 10.00 am –11.00 pm. For more information, you can visit their FB page here. ECity is another successful electronic chain across Dubai and is famous for its multi-brand variety. ECity stores are located across exquisite malls in Dubai that offers buyers a premium shopping experience. It also offers a multi-brand product category comprised of over 100 international brands including computers, laptops, cameras, gaming items, general electronic items, smartphones, consumer electronics, electronic accessories and home appliances. ECity offer the ultimate technological and electronic solution to your personal and business needs with their premium customer service and highly skilled staff too. ECity stores are located in Midrif City Centre, Dubai Mall, Mall of Emirates, Wahda Mall and their service hours are from 10.00 am –11.00 pm. For further detail visit ECity’s Facebook page here. Sharaf DG is an international multi-brand and multi-service electronic store in Dubai. It offers a whole new concept of electronic retailing to meet the dynamic consumer demands. You may find variety of IT, gaming, video, audio, home appliances, wearable technological accessories, smart phones, cameras, computers and laptops. You may easily locate a Sharaf DG across shopping malls in Dubai. As, there are over 15 up-to-date, user-friendly and high-tech stores of Sharaf DG in City Center Mall, The Dubai Mall, Bur Dubai and Times Square Centre. Sharaf DG stores remain open between 9am until 11.00 pm. Click here to visit Sharaf DG’s Facebook page. Jumbo Electronics is a powerhouse for electronic freaks in Dubai. It is among the largest electronic selling stores. Jumbo electronics has an extensive array of home electronics, personal electronics, telecom, IT, smartphones, home & office automation, gaming supports, fitness devices and apparatus, etc. Jumbo electronics also offers super-saving discount deals and prizes that also facilitates you to buy premium products at the most affordable prices. Jumbo Electronics is located in Burjuman Centre-Dubai and remains open every day between 9am to 11.00 pm. For further detail visit Jumbo Electronics’s Facebook page here. Jacky’s Electronic is a colossal electronics retail store in Dubai. Here you can find a variety of numerous electronic offerings ranging from media players, music systems, portable electronics, photographic equipment, smartphones, laptops, computers, home appliances, office automation and all types of consumer electronics and wearable accessories. Jacky’s Electronic is also very famous for its customer protection plans, discount deals, sales and gift vouchers. Jacky’s Stores are situated in Dubai Mall, Ajman City Centre and Nasser Square that remains open between 09.00 am –11.00 pm daily. For more details, click here. Denon UAE is a Japanese electronic store that offers a wide range of Japanese electronics in Dubai. If you are fond of Japanese electronic items, then Denon is the best place to go after in Dubai. Denon specializes in audio accessories, home theaters, cinema and audio equipment. Denon integrates the technology at the best in its electronic products. It also represents over hundred Japanese and other international brands related to audio and video. You can find here high quality electronics with international warranties and satisfactory customer service. The Wonder world of Denon is located in the Dubai Mall that remains open for you between 10.00 am –10.00 pm. Click here for more details. GoSmart is a new electronic store in Dubai, however it offers unique, innovative electronic products of national and international brands. GoSmart basically aims to make our lives simpler by offering electronic innovation. Here you can find high-tech electronic products that suit your fast lifestyle. You may find consumer electronics and accessories her such as rest pads, smart watchers, stylus, car fixer, supportive operators for several devices and device holders. GoSmart is located in the Dubai Mall. Timing are 10.00 am –10.00 pm. To visit GoSmart on FB, please click here. Eros Digital is the ultimate name for buying digital products and consumer electronics in Dubai. Eros currently offer an inclusive array of home appliances, consumer electronics, air conditioning automation for home and offices, telecom, IT and digital accessories, you may also find allied product range of multiple brands here such as Hitachi, Samsung, Flip, Candy, Cisco, Linksys, TCL etc. Digital Home of Eros is at the premium location in Dubai Mall, Midrif City and Mall of Emirates that offer services between 10.00 am –11.00 pm. For getting more information click here to visit the FB page of Eros Digital. Samsung Electronics is a brand that does not need any introduction and is one of the most visible brand across the globe. It has become a compulsory fabric of our life and we all must have at least one product from the house of Samsung. As a global leader in electronics, Samsung has an incredible variety of home appliances, smartphones IT, automation and consumer electronics. An exquisite showroom of Samsung is located in Dubai Mall that serves between 10.00 am –10.00 pm. For getting more information click here to visit the FB page of Samsung Showroom-Dubai Mall. Plug-Ins Electronix is another alternative for your electronic shopping in Dubai. It is an IT retailer, which provides a great variety of smartphones, laptops, computers and consumer electronics. It also offers you an interactive experience for various products that you can try before purchase. Plug-Ins is well-known for its highly skilled, trained and assisting staff and excellent customer service. You can buy from Plug-Ins store located in the Dubai Mall every day between 10.00 am –11.00 pm. Click here for latest discount and offers. 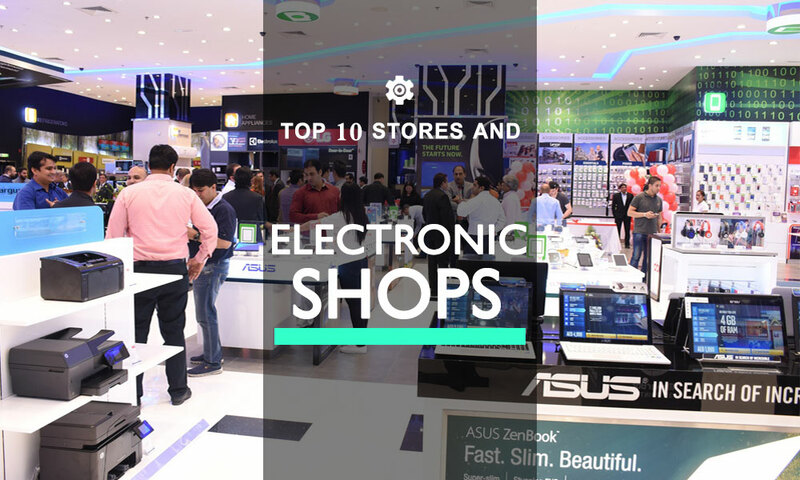 These are top 10 electronics shops in Dubai that are greatly recommended for buying electronics. If you want to recommend an electronic shops in Dubai, please do so by adding comments below. To shop electronic items online, you can checkout stores to buy electronics online in Dubai. Jumbo electronics and prices affordable. This is a joke.